Gallery — Calumet Woodworks Co. The owner of this home had her sights set on transforming this once dated traditional layout into a light filled space that calms the mind, with clean lines and a touch of old world charm. V-groove poplar wall paneling in the kitchen adds texture to the minimalist pallet. Grey cabinetry with slab drawer fronts and shaker doors anchor the home with a transitional feel . 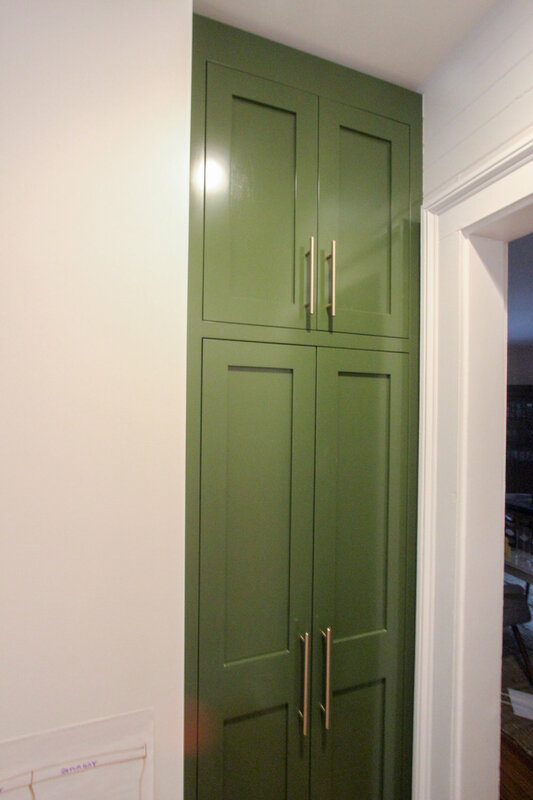 Custom five panel doors throughout the interior give the home an authentic farmhouse feel. This piece takes advantage of high ceiling and generous wall space to provide a workspace close to home. Solid walnut work surface and maple drawer boxes add touches of warmth to the clean lined gloss white case. Simple shaker styling leads the eye to highly figured walnut and three piece crown moulding details. A mid century ranch has a new wing added with surprising versatility. An office doubles as a spare bedroom with a sleek murphy bed built into the front wall. Clean shaker styling, in-cabinet usb ports, and subtle bookcase details has guests wishing this was home. Custom mahogany doors combined with bold profiles highlight the elegance of this rural retreat. A nook in an upstairs hallway is outfitted with a very special set of built-in bookcases. The lumber used in the construction of the doors was reclaimed from the homes existing floor joists. Each panel is resawn and book matched showcasing interestingly face like features.